A great way to help relieve leg pain, especially if you have to stand all day, is to wear compression socks. Today’s styles use the latest fabric technology and come in all sorts of fantastic colors and styles. They are nothing like the medical looking designs of the past. Support socks can help with a range of health concerns that cause leg pain, including plantar fasciitis, muscle soreness, inflammation, and circulation. If you have been having problems with sore legs at the end of the day after standing or sitting for a prolonged period, you should try them out. In a lot of cases, they can have a considerable effect in helping to eliminate leg fatigue and soreness. Whether you are looking for a mild or a moderate compression, we have compiled a list of some of the best socks that are being sold today as well as what you need to know to find the best product for you. You should always consult with your doctor before trying out compression socks for the first time in case you have any underlying medical concerns that need to be treated. If you are looking for a product to get rid of tired, aching legs, you will first need to consider support level. Designs with lower pressure levels offer support for preventive care reasons. You can get these over the counter or online without the need for any prescription. For stronger designs for more severe health concerns, you should consult with your doctor. In this post, we are only looking at styles with mild or moderate levels of support. Mild (8-15 mmHg) can provide relief for tired and achy legs and leg fatigue you get from long periods of standing or sitting. It will also reduce minor swelling in the legs, ankles, and feet. Moderate (15-20 mmHg) can help to reduce the feeling of achy, tired legs, as well as help reduce swelling. They are also useful as a preventative measure to stop the progression of varicose veins. In some cases, they may also be used to help to prevent Deep Vein Thrombosis during travel when on long flights. When choosing a level of support, keep in mind that the higher the number, the more pressure gets put onto your ankles and legs. If you have never used compression socks before, it would be best to start with a low level and work your way up to a higher level. The best support stockings to treat tired, achy legs is mild to moderate level. 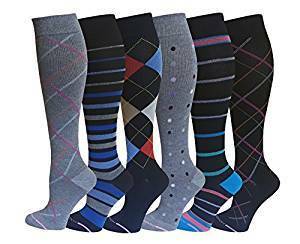 We have rounded up a few different selections that mainly vary by the length of the sock and by the strength of compression. An excellent mild support sock that works well for people who are on their feet all day is this fun sock from Nurse Mates. 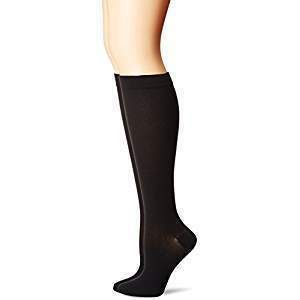 The Nurse Mates Women’s Compression Trouser Sock has a Graduated Compression of 12-14 mmHg. They are good for helping to increase circulation and prevent swelling. You can also wear them for travel if you have a long flight since they aren’t super tight, but do give you a level of support for your foot and up the leg. They come in fun colors and patterns and are very cute. The only problem with this style is that it is one size fits most, so if you fall outside standard sizing, they may not be the best option. This six pack of mild 8-15 mmHg graduated compression, knee-high style from Dr. Motion are another inexpensive option if you are looking for something that can help with tired legs, circulation or minor swelling. They aren’t super tight, and the sizing is limited, so they may not be the best option for everyone. Most women will find that these styles are comfortable, affordably priced, and come in fun patterns. 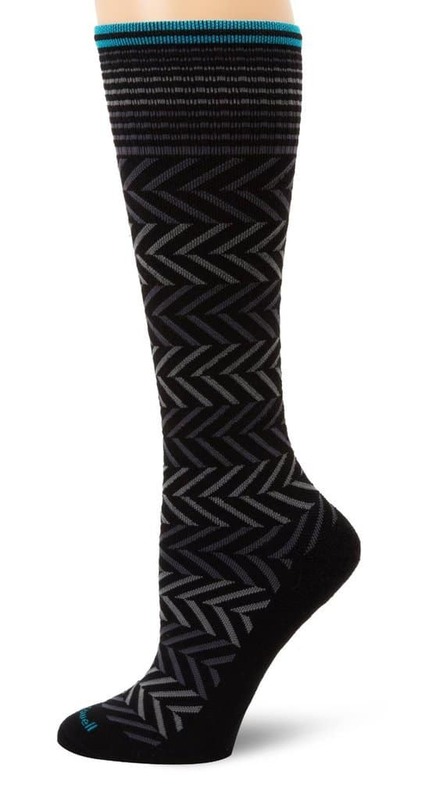 Sockwell Women’s Chevron Moderate (15-20mmHg) is a low-level compression. They will work well for most women for activities like flying, as well as for long periods of sitting or standing. They can help to minimize swelling and cut down on foot and leg fatigue and aches. This sock is made in the USA, and it uses something called Accu-fit technology, so it shouldn’t stretch out or become loose as you wear it throughout the day. The fabric is superfine merino wool with bamboo or alpaca. They come in a wide variety of colors and attractive patterns. This popular and inexpensively priced option from Fytto provides a moderate 15-20mmHg graduated support level. They are an excellent option to promote blood circulation and help with tired aching and fatigued legs. The material is a latex-free, smooth knit fabric that most women find to be comfortable and not too constricting. They come in a wide array of neutral colors that work well with dress pants or work trousers. If you are looking for everyday black, mild support styles, a good one to check out is MediPEDS Socks. These are designed specifically for diabetes-related symptoms like leg fatigue, swelling, and dry skin. They are made of 58% Nylon, 38% Polyester, 4% Lycra Spandex and are reportedly very comfortable. The fabric choice is intended to reduce foot irritation and the wrong kind of pressure on the legs. This design is okay to machine wash, and the company also offers a satisfaction guarantee, so if you aren’t happy with your purchase you can return for a refund. The compression on this sock is mild, so they are great for walking, being active, sitting for moderate amounts of time. They probably aren’t firm enough if you are on your feet all day or are sitting for long periods like on a long flight. The 2XU Compression Sock for Recovery is a little pricier and has more design features than some of the other socks on our list. This design is made to specifically support the arch position and give the maximum support for your feet. The material is a lightweight fabric that is comfy, but still able to deliver benefits of moderate graduated support. They also come with a vented toe panel for those whose feet tend to get hot and sweaty. 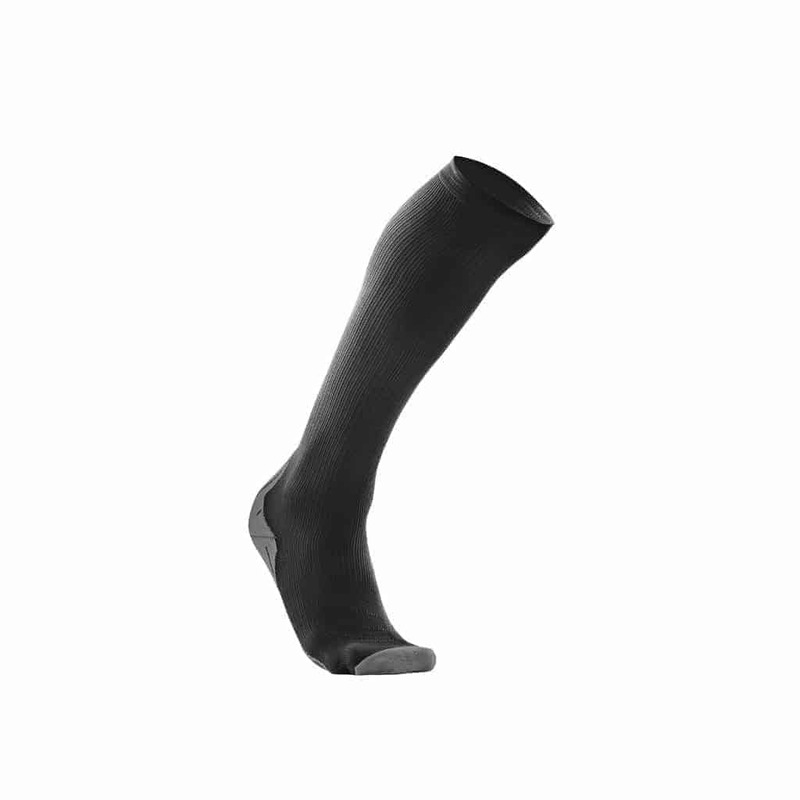 Compression socks work by applying pressure to ankles, legs, and feet. Graduated compression means that the pressure is the highest at the ankle and decreases as the fabric goes up the leg. The compression can increase circulation and help prevent things like blood clots or varicose veins. You need the pressure to be the strongest at the ankles because the blood circulating in your feet and ankles has to be pushed back up to your heart and not stay pooling in your legs since that can lead to the tired, achy leg feeling that you feel at the end of a long day on your feet. Compression socks can offer a lot of different benefits depending on the level of support you are using. The products that we include in this post are mild to a medium level that will help to eliminate sore, aching legs and reduce minor swelling. If you choose a higher level of compression, you will find that they can help with slowing the progression of varicose veins, reduce the risk of deep vein thrombosis and help with more severe swelling of the legs as a result of the accumulation of fluids. You don’t need a prescription to buy compression socks, but if you are purchasing any products over a moderate level (20mmHg or higher) or if you have any particular health concern that you are unsure of regarding compression, you should consult with your doctor. Your doctor can make sure it is okay for your specific situation and to help with sizing and determining the right support level for you. You should not wear compression designs while sleeping unless your doctor has advised you otherwise. Most stocking will last 3 to 4 months before losing their initial strength. Comfort and Fit– When looking for the right sock you have to find a balance between getting the right amount of pressure and getting a comfortable fit. It is a little easier said than done. Most women who have been wearing support socks for years have drawers full of products that just don’t fit quite right or aren’t comfortable. Unfortunately one of the best ways to find a great sock is by trial and error, so you may want to look for brands that have good return policies. If you have tried compression in the past and did not find success, don’t give up, you may need to try a different brand. Price – Compared to regular styles support socks can be expensive. They can range in price from about $20 to $100, depending on the size and style. They can be bought online, at a medical supply store and many pharmacies. Breathability– Some of the most current high tech fabrics combine moisture-wicking properties and venting panels to stop your feet from overheating or sweating. If you have an issue with your feet overheating check products descriptions for specific wording that says the material the sock is made from is breathable. Ease of Taking On and Off– By their very nature compression designs are not comfortable garments to get off and on. It may take a lot of strength and force when you first start out wearing these designs. The styles with the least amount of support will be more natural to get on. Sizing-Sizing is different from brand to brand and can be quite confusing considering calf and ankle sizes vs. shoe size. The other problem with sizing is there isn’t a vast range of sizes to choose from in the same way you would select a shoe size. If you are lucky, you should be able to choose between an XS, S, M, L, XL, but many brands are one size fits most. Material: These days the most common fabrics for these types of designs are lycra, spandex, and rubber. You will probably have to test out a few different brands to find a material that you find comfortable. When making a selection, think about other comfortable garments that you have and what fabrics they contain. You can then start to narrow down what materials to look for. Who Should not Wear Compression Socks? Since these products are generally pretty expensive, you should follow all cleaning instructions that come with the brand that you buy. Many of the socks should be washed by hand using cold water and a bit cleaning solution. You should air dry them and don’t put them in the dryer, as it will ruin the material. Most styles only last about 3 to 6 months with regular wear and will need to be replaced after that since they will lose elasticity. If you do choose to wash them in a washing machine, it will shorten the life of the sock. Compression socks can be very beneficial for a wide variety of health concerns, but it is best to get advice from a doctor before buying. If you are wearing socks to help with tired, aching legs, only wear them during the day and take them off before you go to bed. You don’t have to wear them when you are sleeping or if your legs are elevated.